Customized red & white 62” arc vented golf umbrellas are largely preferred for marketing because businesses know that it is going to bring them easy recognition. Red and white - combination is always adjudged as electrifying and over the years, marketers have always tried to incorporate it within their campaigns. 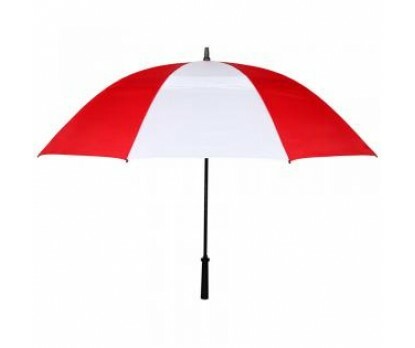 Promotional red & white 62” arc vented golf umbrella can be employed for promotions by marketers who have enjoyed just moderate success with their campaigns and wish to play long innings. This arc vented and durable golf umbrella can be identified with its features - sturdy fiberglass handle, windefyer vented and nylon canopy, and shoulder strap sleeve. 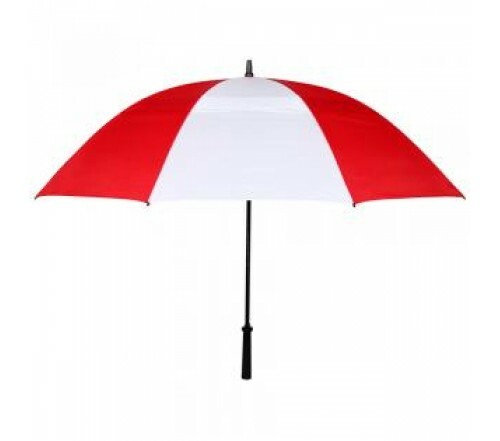 This personalized red & white 62” arc vented golf umbrella is perfect for any type of outdoor marketing because it can withstand bad weather conditions with ease and still show up above the heads. Imprint area - 10"W x 8"H. Dimensions - 62" arc - Closes to 39".